Weekly RV Accessories Giveaway - TowMate 26" Wireless Tow Light Bar - With Diamond Tread! This week 1 lucky winner will win a TowMate 26" Wireless Tow Light Bar - With Diamond Tread! If you are looking for the perfect tow light to use when towing a vehicle behind your RV, then check out the TowMate Wireless Tow Light Bar With Lithium Technology - Diamond Tread. RVupgrades.com Weekly RV Accessories Giveaway! We have a weekly RV Accessories Giveaway - this week is a Bauer SOVS Sun Out RV Vent Shade! Every week we will be giving away an RV accessory! This Week 1 lucky winner will win a Bauer SOVS Sun Out RV Vent Shade! Shade the inside of your RV from the sun shining in through the roof vent. 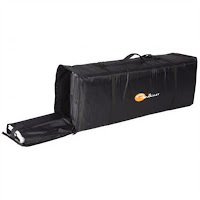 The Bauer SOVS Sun Out RV Vent Shade is designed to keep the light out of your RV, camper or trailer. Keep the vent over your RV bed shaded so the sunlight doesn't wake you in the morning! What RV Supplies Do You Need to Have the Safest Motorhome on the Road? For many RV owners, the number one priority is making their motorhome as comfortable and cozy as possible. People spend a great deal of time in their RVs, as they cruise for weeks, months, or even a full year. This time is frequently time shared with family members, and space is tight when everyone is inside the motorhome. So, it is understandable that the comfort of an RV would be of huge importance. What Are the Best RV Parts to Turn Your Motorhome Into a Luxury Ride? The purchase of an RV is a major investment. This is not just another vehicle, like a car, truck, or motorcycle, but more akin to buying a second home. As such, it is common for buyers to want a handful of specific features in their motorhome. Special features aren’t always available in a standard RV, but there are a number of upgrades and renovations that can be done after purchase to improve your ride. There are some accessories and supplies that are an absolute necessity in an RV. Without these essentials life on the road, especially with family members in tow, would probably be unbearable. Then there are the motorhome accessories that simply up the ante. These are the accessories and cool devices that make your RV more than livable; it becomes downright comfortable. Road trips in your RV or camper can take you to some incredible destinations. From the Pacific Northwest to the beaches of Florida, you can see it all from a mobile home. While taking on the open road, you can also take in some of the most remote vistas of North America. Adventuring to remote destinations offers a glimpse of rural areas that many other people don’t have. Sooner or later every RV owner encounters some type of motorhome malady. For some this is a minor incident that is quickly fixed and forgotten, but for others a single problem can quickly lead to a significant inconvenience. While it isn’t enjoyable to be the bearer of bad news, some camper parts fail more than others and can give motorhome owners more trouble out on the road. To help remedy any common problems you might encounter, you can find tips on how to avoid these broken parts or make a repair by reading below! Road trips are a classic American experience that many families hope to undertake someday. Whether you dream of driving the winding roads of Yosemite National Park or crossing through the wide expanses of the Painted Desert, road trips involve a lot of downtime together. Even the most patient and cooperative family can come under the effects of cabin fever if the challenges of the road build up. The good news, though, is that a few key RV accessories can help stave off cabin fever and make things genuinely pleasurable while on the road. This article is devoted to highlighting just which accessories are likely to improve your life, save you headaches, and make you even more excited to hit the road and see all the wonders America has to offer! There is nothing better than taking your RV or camper on a big adventure. Couples and families choose every year to drive to their favorite local destination and camp out, while others head off across the entire country (sometimes even venturing into Canada or Mexico). While all of this driving is the reason behind buying your RV in the first place, it sure gets dusty and dirty along the way. As well, the spacious interior of your camper can start to feel small and crowded in those hours between a day’s driving and bedtime. Often, your family members or pets spent most of the day relaxing in the back of the RV, perhaps playing some games and getting out for rest stops, but once you park for the evening, it is time to stretch your legs and spend a bit of time outside. It can be difficult to find a clean, safe space to do this when you are living out of your RV.